Want to get involved in EBC? Why not make it known by volunteering! Click the "More" button below to learn more! Click on one of the areas below to learn more about EBC and its ministries, our service times/locations, or want to get integrated into our weekly communications. Greetings from the EBC family. We are so pleased that God led you this way and our prayer is that you will experience our Lord in a life-changing way. There are many exciting activities for all ages at EBC. Please review our Monthly Calendar and Ministry Pages during your web visit. Our purpose is to let everyone know of the great happenings within this branch of Zion so that you and your family can join us in the thrill of growing in the Lord as a Family unit. Take a moment to invite one of your neighbors, a coworker, a friend, or relative to join us for Sunday Worship services or one of the great EBC events we have planned! Click here to send an e-vite! First time visiting EBC? Thank you for choosing EBC as your place to worship! Click here to read more about what to expect in your visitor's experience with this branch of Zion! Have you ever asked the question, "Is there anything at my church that can help me with the pressures in my life (family, job, finances, relationships, spiritual growth, church activities, etc.)?" Are you in need of practical solutions to your everyday problems? Then Christian Education at Ebenezer Baptist Church is the answer! If you are interested in participating in this new contemporary approach to Christian education at Ebenezer and for an opportunity to bring your preferences to a discussion about classes and other educational offerings, sign up for one of the Roundtable discussions. The Roundtable discussions will seek to gather additional input on the topics below previously identified in our Church Education Survey. For more information about our Christian Education Ministry, click here. 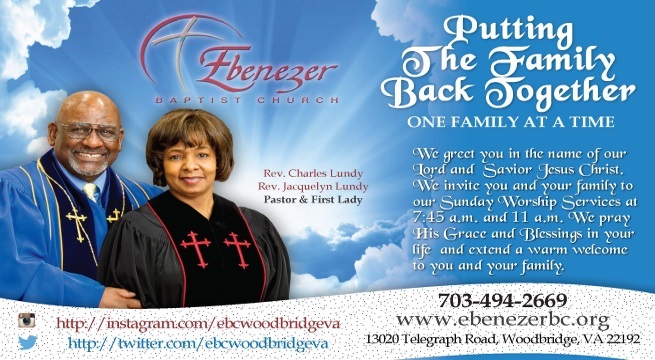 Join the EBC Family for our Easter Sunday Services beginning with our Sunrise Service at 5:45am at the Occoquan Gazebo, our 6:45am Easter Breakfast, and 7:45am/11:00am worship services at the EBC Family Life Center. Come help celebrate our Lord and Savior, Jesus Christ! Want to invite a friend? Click here to send them an e-vite today! Join us on May 18th for our annual EBC Community Outreach Day! FREE clothing/shoes for ALL AGES (Men, Women, Boys, Girls), FREE food, and GREAT fellowship! You won't want to miss this. Click here to download a copy of the event flyer to distribute to family and friends! Want to invite someone? Click here to send them an e-vite today! Join our EBC Sports Ministry as it hosts it's 8th Annual Kendra Haskins Community Give Back Basketball Camp! Enjoy a day of fundamental basketball, games, and prizes! Click here to download a copy of the event flyer to distribute to family and friends. Want to invite someone? Click here to send them an e-vite today! Join us on June 15th for our annual Flea Market. Click here to download a copy of the event flyer to distribute to family and friends. Want to send an invitation? 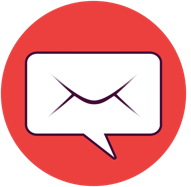 Click here to send an e-vite today! Join us every Sunday from 9:30am - 10:30am for our weekly Sunday School. We have classes for all ages! Come an learn about God and grow with us in Christ! Want to invite a friend? Send them an e-vite today? Click here to download a copy of our Sunday School flyer to distribute to family and friends! 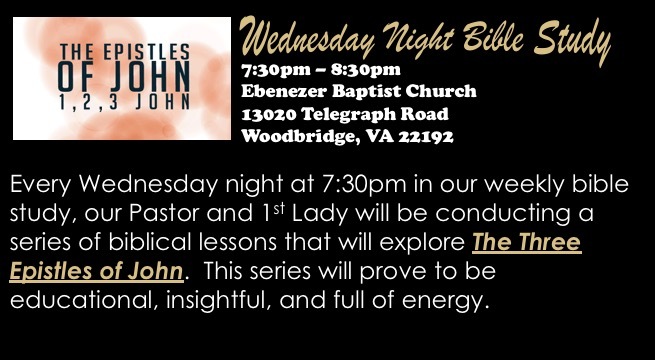 Please join us every Wednesday night at 7:30pm in our weekly bible study where our Pastor and 1st Lady conducts a series of biblical lessons that will explore the Three Epistles of John. Click here for more information. We offer excellent indoor facilities to host your activities and events. For more information, click here. On June 23, 1990, Rev. 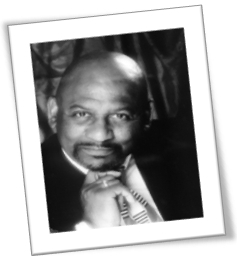 Charles A. Lundy was called of God to Pastor the Ebenezer Baptist Church, Occoquan, Virginia. He mounted the pulpit with the sermon, "Stay in the Ship" and with the theme, "We're Marching To Zion." His favorite hymn is #340, "What A Friend We Have In Jesus." 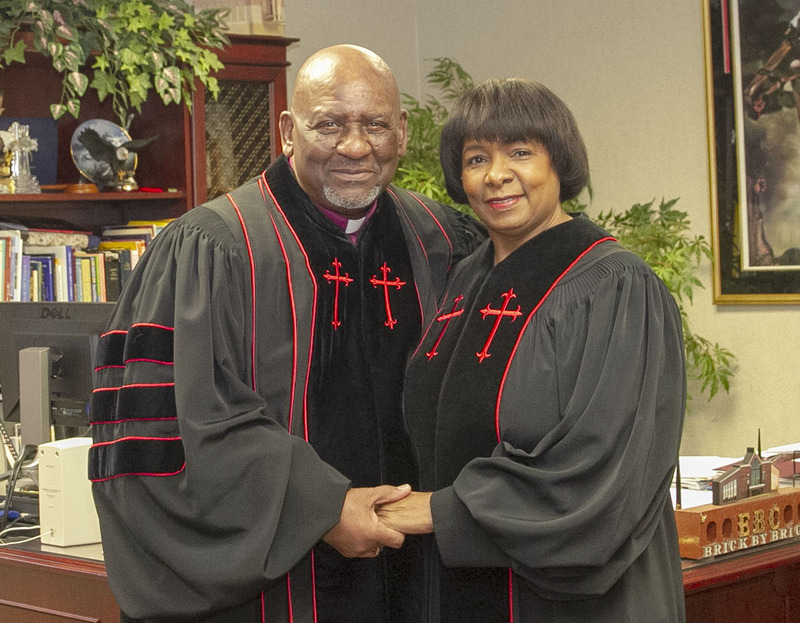 His pastoral focus is "putting the family back together." COUNT ME IN! is EBC’s volunteer program supported by members and friends of Ebenezer. A growing church is always in need of skills, experience and expertise that exist among the membership. A committed core of spiritual servants can augment staff by volunteering time, talent and treasures to provide services in many varied areas of our church ministry and mission. Another aspect is the power of the tongue to share Ebenezer with others and invite them to our worship services, special programs, activities and events. For more information, click here. April is National Alcohol Awareness Month. Alcohol and drug use can be dangerous. Overdoses, injuries and accidents may occur, with harmful consequences. These symptoms can be dangerous and should be managed by a physician. For more information, and to get help for you, a friend, or loved one, click the link below. Would you like to make a church donation or pay your tithes/offerings online? You can now make one-time or recurring donations using our secure donation platform. Please click the image button below to be redirected to our online giving page. Thank you for your patronage and may God continue to bless and smile upon you. Follow us on Facebook! Our EBC Facebook community is growing day-by-day. Come join us there! 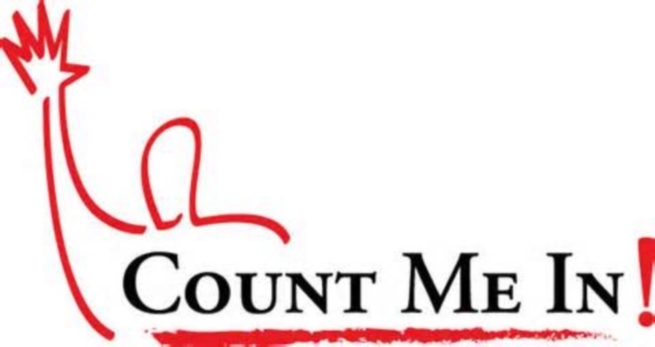 Also, check out our YouTube channel to see EBC ministries in action! Catch our latest tweets on Twitter! And follow us on Flickr to see photos from EBC events and activities! Keep up with what's going on within EBC's weekly activities as well as see the general format of our services by downloading a copy of our weekly bulletin! 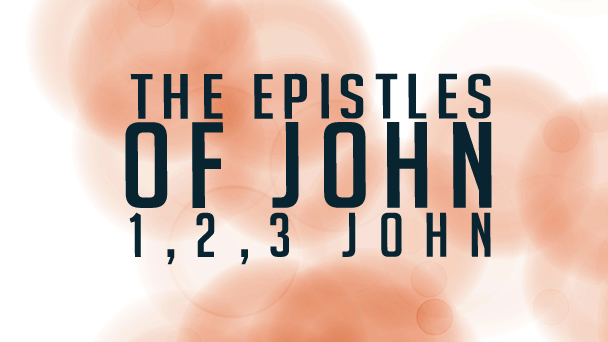 Come out to the EBC Family Life Center during our weekly Wednesday night Bible Study starting at 7:30pm and participate in a series of biblical lessons that will explore the three Epistles of John. You don't want to miss this! For more information, click here. If you stand in the need of prayer and want to make a prayer request, click here. Ebenezer lifts our brothers and sisters who are heroically serving our great country in prayer. We salute our men and women of the Armed Forces for their safe and speedy return.